Ice extracts are a much safer way to obtain highly concentrated THC, rather than the “easier” butane method. Ice hash is clean and earthy, definitely something every stoner should try at some point. It’s not as difficult to make as some people think. Here’s a step by step tutorial on how to make ice hash yourself and get a good yield of some serious fire. First, take the bud and put it in the coffee grinder, turning it in to a powder. Don’t try to put all of it in at once. Grinding about 7 grams at a time usually works pretty well. Once all of the marijuana is ground up, carefully pour it in. Use a funnel of some sort to make sure that you get all of it. Then, take about 7-8 ice cubes and place them on a washcloth. Fold the top of the washcloth over and hit the cubes with the rubber mallet until they’re almost powder. Pour that in to the milk jug as well. Next, add cold water to the jug, bringing the level of the substance 3/4″ of an inch above where the marijuana level was. Put the cap on the milk jug and shake it for 5 minutes, then put it in the freezer for 5 minutes. Repeat the shaking/freezing process two or three times. Now, grab the coffee filter and strain out all of the liquid in the jug. Make sure to get all of the liquid strained in to the bowl. With your freezer set to the highest setting, put the bowl of water in the freezer. Be very careful with it and try not to disturb it too much. The bowl should sit in the freezer for around 45 minutes, or until the fluid begins to form a delicate ice layer. It’s also a good idea to tap the bowl lightly with a spoon. The trichomes are in the water and the most dense, heavy ones will fall to the bottom of the bowl. After the liquid forms the thin layer of ice, remove the bowl from the freezer. Don’t let the liquid swish around or you’ll disturb the settled trichomes. Using a turkey baster or something similar, slowly remove the liquid from the bowl. This is a time consuming process because you can’t disturb the settled matter at the bottom. Once the liquid gets down to a very low level, you can use paper towels to help absorb. After you’ve removed the liquid, take a hair dryer to the mixture, carefully drying it. The mixture should get lighter and be about the same color all the way around. 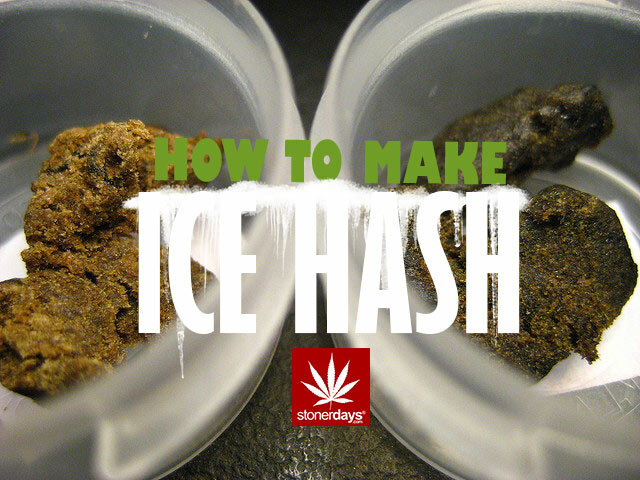 I’m sure that there are more complex ways to make ice hash but for those without access to better equipment, this is a pretty easy way for anyone to make their own ice hash and without a lot of bud. I hope that this method works for you! If you think you’re method is better, let me know! Email your tricks to [email protected]!